Iblis makes those seeking righteousness feel lazy, and he causes those who are serious to procrastinate. He convinces a jurist to rest instead of going over his lesson again. And convinces a worshipper who had woken up to pray at night that he still has a lot of time. Iblis tries to make people lazy procrastinators, and to make them have hope (of a long life). A disciplined person must take advantage of time, and never procrastinate. That which is feared can never be trusted, and that which passes can never be brought back again. The main reason for doing less good and more evil is relying on the hope of a long life, this is because a person continues to pro­crastinate performing good deeds and refraining from evil deeds. Musnad Ahmad, 5/412, Bukhari in al- Tarikh al-Kabir, 3/2/21 6 and lbn Majah #41 71 . When death befalls someone, he should know that it is an hour of serious suffering because it is a moment of severe pain, when he is leaving all objects of love, his loved ones, and to all that the horror of the throes of death and fear of where his wealth go. Then Shaytan comes and attempts to have the slave [of Allah] become discontent with his Lord, he tells him ‘Look at you! What made you die? Is it painful? You are leaving your wife, your children and you will be laid under the ground? So he might cause him to become discontent with his Lord, hating Allaah’s decree, making him say things that include any kind of objection , or he might make him unjust in his will, giving some of the inheritors preference over others, to on and so forth. In this case, we need to cure the whispers of Shaytaan and cure the self . As for the cure for these trials we should first mention that whoever is mindful of Allah while in good health, Allah will protect him when he is ill, and whoever observes Allah in his thoughts, Allah will protect him when he moves his bodily parts. “His seeking refuge in the ‘floundering of Shaytaan at death‘, that is if Shaytaan seizes him when he leaves this world, preventing him from repenting or hinders him from mending his affairs, leaving an injustice or he makes him despair from the mercy of Allaah or makes him hate death or be sorry for this life, so he becomes discontented with Allah’s decree in dissolution, going to the hereafter, so one has a bad end and he meets his Lord while he is discontented with Him. Satan said: ‘Yes.’ When you satiate yourself with food, you experience weightiness and it is for this reason you become disinclined to perform prayers, remembrance and supplications. Hearing this, Yahya vowed: By Allah! Never shall I eat to my fill, ever again. 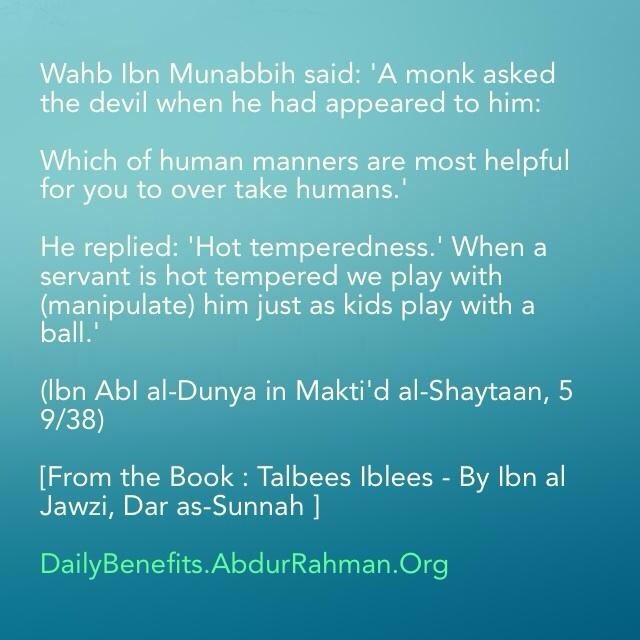 Posted from the excellent Book – The Devil’s Deceptions (Talbis Iblis): By Imam Abu’l Faraj Ibn Al Jawzi. Darussunnah Publishers.You are encouraged to buy this very beneficial Book – around 600 pages. It is from enmity and hopelessness of the devil that his endeavour to misguide mankind from the Path of Allah will persist. This misguidance takes many shades and forms; be it from planting seeds of doubt, or giving rise to deviant ideas antithetical to the sacred teachings of Islam, and essentially becoming entangled within regressive intellectual and rhetorical discourses. The Ummah has suffered varying levels of deviation, some of which remain prevalent today, while more continue to be uncovered – and such is the impact of delusive plottings of the devil and his allies. This book is the sixth instalment from Dar as-Sunnah of the illustrious Imam, Abu’l-Faraj Ibn Jawzi. Being a complete translation of his well-known and prized work, Ibn Jawzi enumerates within it, many of the mechanisms and modus operandi used by the devil in deceiving and leading mankind away from the Straight Path. It is of particular value and importance because only by unearthing and accentuating some of the traps of the devil, can mankind avoid them as well as navigate others away from falling prey to his harm. ‘Abu’l-Faraj Jamal al-Din Abdul Rahman ibn Ali Ibn Muhammad ibn Ali Ibn Ubayd Allah Ibn al-Jawzi al-Qurashi al Tamimi al Bakri al-Baghdadi al-Hanbali (509/510-597) was the Imam of the Hanbalis and foremost orator of kings and commoners in his time, whose gatherings reportedly reached one hundred thousand. A hadith master, philologist, commentator of Qur’an, expert jurist, physician, and historian of superb character and exquisite manners. Ibn al-Jawzi was a prolific author of over seven hundred books. He was the author of a vast number of works of which several have been printed in recent times. He was famous as a preacher and the traveller Ibn Jubair gives an enthusiastic account of two of his sermons heard in Baghdad. Ibn al-Jawzi was severely tried towards the end of his life when his criticism of Shaykh `Abd al-Qadir al-Gilani – his senior of forty years – led to accusations made against him to the Sultan al-Nasir by the Shaykh’s children and supporters. He was taken from Baghdad to the city of Wasit where he remained imprisoned for five years. Ibn al-Jawzi passed away in 597 AH, two years after his release from Imprisonment. What Can This Eternal Life be Bought With? WHEN A PERSON THINKS about the life of this world before entering it, he considers it long. Likewise, when he thinks about it after leaving it, he sees a long period of time and knows that the stay in the grave is long. When he thinks about the Day of judgment, he knows that its fifty thousand years long, and when he thinks about Paradise and Hell, he knows that they will never end. Now, when he goes back to look at the time spent in this world, lets say 60 years, he can see that thirty of it is spent sleeping, fifteen or so is spent in childhood and most of what’s left goes to chasing after desires, food and money. When he accounts for what is left, he finds that much of it is nothing but showing off and heedlessness. The price of eternal life is the hours of his life, but what is left of them for him to buy it with?! Observe, my son, the way you deal with the limits of Allaah and see how you can keep yourself within their bounds. Indeed, he who takes care of these limits is taken great care of, and he who doesn’t, is left to himself. I shall now mention some of my experience to you so that you may observe my striving and ask the Granter of success to bless me. Truly, most of the blessings I have been given have not been earned by me but rather they are conferred as a result of the planning of The Gentle One alone. I remember myself as a child: A highly motivated six-year old sitting in class with older boys. The intellect I had been given superseded of old men. I do not recall myself playing on the road with other kids or even laughing out loud. When I was seven or so, I attended the gatherings in the Masjid. I would not sit in a circle of mere wordplay, but searching for a Hadeeth Scholar who would narrate about the Prophet’s (Sall-Allaahu ‘alayhi wa Sallam) life. I would memorize everything he said, then go back home and write it down. I was blessed for being granted my teacher Abu al-Fadl ibn Nasir (Rahimahullaah) who would take me to different Scholars and let me hear the Musnad [of Imaam Ahmad] and other major works. All this time I had no idea of why I was made to do these things. My teacher recorded all I had heard, and when I reached puberty he handed me this record. I accompanied him till his death, and through him I learned the science of Hadeeth and transmission. The kids used to go down to Tigris River and play on the bridge, but when I was small I used to take a book and sit far from people by the shore studying Sacred Knowledge. Then I was inspired to abandon the vanities of this world so I began constant fasting and reduced my food intake to very little. I trained myself to be patient, embarking on a continuous pursuit in order to do so and staying up at night. I didn’t feel satisfied with studying just one science so I read jurisprudence, sermon delivery and Hadeeth and followed those who practiced Zuhd. After that I studied linguistics. There was not a narrating Scholar or a preacher where I lived who I didn’t sit with and whenever such a person would arrive from elsewhere I would go to him. I used to choose of virtuous deeds what suited me and if I had to choose between two things I usually chose the right of al-Haqq (Allaah). He has planned my life and cultivated me in a beautiful fashion, guiding me towards what is best for me. He has protected me from my enemies, the jealous, and those who might plot against me. He has made everything convenient for my studies of Sacred Knowledge and sent me books from unexpected places. He gave me good understanding, the ability to memorize and write quickly and a talent for authoring books. I lacked nothing of this world. As a matter of fact, things were quite the opposite as Allaah gave me more than enough. He put a great deal of acceptance of me into peoples’ hearts and made the impact of my words leave them not questioning the authenticity of what I had to say. Approximately 200 thimmis [i.e. people of the book who live in Muslim lands according to a truce contract] have become Muslim at my hands and over 100 000 sinners have repented in my gatherings. More than 20 000 men have announced their repentance from foolish ways during my exhortations. I used to go around Hadeeth gatherings of different Scholars and run till I was out of breath so no-one would precede me. I would start my day having nothing to eat and finish it having nothing to eat. Never did Allaah degrade me to take from another person, instead He provided for me in order to protect my honour. Then a group of people – i.e. from the Sufis – came and began to speak to them concerning hunger, poverty, whisperings and notions. And they authored books on these subjects, as was the case with Al-Haarith Al-Muhaasibee. Then another group of people came (afterward) that revised the way of Sufism, characterizing it with attributes by which they distinguished it (from its original state), such as: wearing old tattered clothes, hearing (music), bursting out in passionate emotions, dancing and clapping. And they particularized themselves by exceeding in cleanliness and purification. Then this matter (Sufism) continued to flourish, and their shaikhs began to fabricate stories for them and speak about their mystical occurrences. This affirmed their remoteness from the scholars. Rather, this even affirmed their view that what they were upon was the most complete forms of knowledge, such that they named it the hidden knowledge (al-‘ilm-ul-baatin), while making knowledge of the Religion, apparent knowledge (al-‘ilm-uhd-dhaahir). Among them were those whose severity in hunger brought them to fancy corrupt notions. So they would claim strong love and passion for the truth. It was as if they imagined a figure with a beautiful appearance and thus fell madly in love with it. These individuals linger between disbelief and innovation. Then these people divided into various orders and their beliefs grew corrupt. So among them were those who held the view that Allaah is incarnate in His creation (hulool), and those who held the view that the Creator and creation were in reality one existence (Ittihaad)! And the Devil did not stop speaking to them about different types of innovations until they made them into aspects of the Sunnah. Then there came Abu ‘Abdir-Rahmaan As-Sulamee who wrote a book for them called ‘as-Sunan.’ He also compiled a book for them called ‘Haqaa’iq-ut-Tafseer’, in which he mentioned amazing things about them (i.e. Sufis) concerning their interpretation of the Qur’aan, based on the (mystical things) that occurred to them, without tracing that back to any of the sources where knowledge is derived from. And indeed, what brought them to take such things and place them as their views was their state of daze, due to their strict abstinence of food and their love for talking at great lengths of the Qur’aan. Abu Nasr As-Siraaj wrote a book for them called ‘Lum’-us-Soofiyyah’ in which he stated horrendous beliefs and hideous statements that we will mention later in more detail, by the Will of Allaah. And Abu Taalib Al-Makkee wrote the book Qoot-ul-Quloob in which he mentioned fabricated ahaadeeth and narrations that cannot be traced back to any source with regard to the subject of prayers during the days and nights and other subjects. He also mentioned false doctrines in it and constantly repeated statements such as: “Some of the mukaashifeen (those to whom Allaah has disclosed secrets of hidden realities) have stated…” These types of words are empty and pointless. He also mentions in it, relating from some Sufis, that Allaah reveals aspects of the hidden matters to his “saints” in this world. Then there came Abu Nu’aim Al-Asbahaanee who wrote a book for them called ‘Hilyat-ul-Awliyaa’, in which he mentioned many evil and despicable things on the laws of Sufism. And he had no shame in stating that Abu Bakr, ‘Umar, ‘Uthmaan and ‘Alee, as well as the rest of the high-ranking Companions, were from among the Sufis! So in this book, he spoke of amazing things that occurred to them. He also mentioned Shuraih Al-Qaadee, Al-Hasan Al-Basree, Sufyaan Ath-Thawree and Ahmad bin Hanbal as being from among them (i.e. the Sufis). Similarly, in ‘Tabaqaat-us-Soofiyyah‘, As-Sulamee mentioned Fudail (bin ‘Iyyaad), Ibraaheem bin Adham and Ma’roof Al-Kurkhee as being from among the Sufis, by pointing out that they were individuals who abstained from the worldly life and its luxuries (zuhd). Sufism is a way that is well known for exceeding in abstinence of worldly luxuries (zuhd). What shows the difference between them (i.e. scholars above, and the Sufis) is that no one ever condemned abstinence (zuhd), whereas Sufism was condemned because of what we will mention later. ‘Abd-ul-Kareem bin Hawaazin Al-Qushayree wrote a book for them called ‘ar-Risaalah’, in which he mentioned many far-fetched and mystical things such as talk on al-fanaa (annihilation) and al-baqaa (subsistence), al-qabd (contraction), al-bast (expansion), al-waqt (the moment), al-haal (ecstasy), al-wajd (finding) and al-wujood (existence), al-jam’ (union) and tafaruqqah (separation), as-sahu (clarity) and as-sakr (drunkenness), adh-dhawq (taste) and ash-sharab (drink), al-mahu (effacement) and al-ithbaat (affirmation), at-tajallee (manifestation) and al-muhaadarah (presence), al-mukaashafah (unveiling) and al-lawa’ih, at-tawaali’ and al-lawaami’, at-takween and at-tamkeen, ash-sharee’ah and al-haqeeqah (reality), and other insanities that do not amount to anything. And his tafseer is even more bizarre than this! Then there came Muhammad bin Taahir Al-Maqdisee who wrote ‘Safwat-ut-Tasawwuf‘ for them, in which he stated things that any person with common sense would feel ashamed to mention! We will mention what is proper from its subjects, with the Will of Allaah. Then there came Abu Haamid Al-Ghazaalee who wrote the book ‘Ihyaa ‘Uloom-ud-Deen‘ for them, according to the methodology of the (Sufi) people, which he filled with baseless ahaadeeth even though he knew well they were baseless. He spoke about knowledge of the Mukaashafah (unveiling of unseen by Allaah to Sufis) and withdrew from the principles of Fiqh. And he stated such things as: ‘Indeed the stars, the sun and the moon, which Ibraaheem saw, were in fact lights that screened Allaah!’ Such things are not mentioned in any of the sources of knowledge. Rather, this is from the types of speech of the Baatiniyyah. The factors that caused these individuals to write these books was their little knowledge of the Sunnah, Islaam and the narrations, as well as their dedication for what they approved of from the way of the people (Sufis). They only approved this way because of adoration for abstinence (zuhd) that was established in their souls. They did not see any condition better than the condition of these people (Sufis) in regards to appearance, nor any speech more pleasant than their speech, whereas in the biographies of the Salaf, they found a form of harshness. So the people inclined very strongly towards these individuals (Sufis). Translator’s Note: These are names for Sufi concepts and beliefs. Some of them have been defined as such: Fanaa: (Annihilation) A state in which the mureed (Sufi) becomes so absorbed in dhikr that he becomes unaware of himself and his surroundings and is at tranquility with the remembrance of his Lord, negating or annilihating his self. Bast (Expansion) and Qabd (Contraction) refer to the various degrees of relative union and separation from the Creator. Baqaa: The consciousness of survival in Allaah. Waqt: (Time) The moment in which someone becomes conscious of the reality and the Creator; the mureed is neither in the past or the future. Mukaashafah: (Unveiling) The state in which the Truth (Allaah) and the Unseen become revealed to the Sufi. Tajallee: (manifestation) the state in which Allaah manifests revelation to the Sufi. Sakr: (Drunkenness) A state in which the mureed is absorbed in the hidden matters to the point that the common person cannot understand him. Wajd: (Finding) State of ecstasy in which the Sufi finds the realization and presence of Allaah, usually after hearing (Samaa) dhikr. Jam’: (Union) A state in which the Sufi only sees the Truth (Allaah) without the creation. Muhaadarah: (Presence) Being in the presence of Allaah. Tafarruqah or Farq: (Separation) When the Sufi in the state of Fanaa sees the creation (i.e. himself), the opposite of Jam’. And Allaah knows best. Abu al-Faraj ibn al-Jauzi  has related a unique story from al-Hassan al-Basri (rahimahullah). The story, depending on how authentic it is, shows the ability of a human in overpowering Shytan if he is sincere to Allah in his religion and it shows how Shytan can take advantage of the human when he strays.